For the next five Saturdays, Reel Retro Cinema is going to take a look back at Dell’s attempts to bring big-time movie stars Frankenstein, Dracula, the Wolf Man, the Mummy, and the Creature to four-color life. Anyone with a heart condition must leave the room! 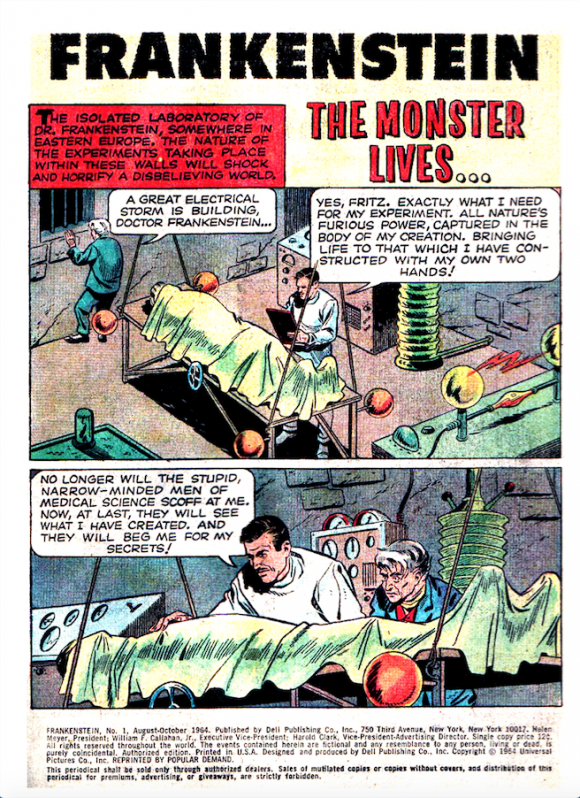 Published in 1964, The Monster Lives, by Don Segall and Bob Jenney (pencils and inks), opens with all the familiar trappings of the Frankenstein story — Dr. Frankenstein and Fritz and conducting an experiment to bring the dead back to life! We flash back to Frankenstein’s colleagues scoffing at his theories, so he and Fritz go about their secret work at night. Grave robbing, Fritz bringing back the wrong brain, etc. — the kind of stuff the AMA generally frowns upon. Lightning strikes, and the monster arises! Before this miracle can even be appreciated, Fritz foolishly waves a torch at the Monster, scaring him off, and he escapes. It’s here that the word “adaptation” really takes a beating, as the story completely diverges from the one we know, forging its own path in giant, size-13 boots. The Monster comes across two kids having a picnic. As he approaches, he’s not exactly met with kind words. 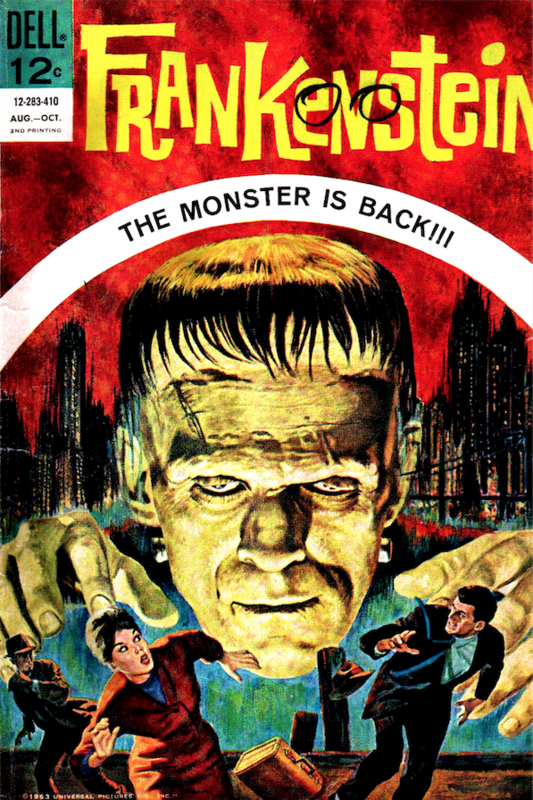 The young girl screams, and the young boy hurls a rock at the Monster’s head. The little girl falls to her death, the Monster picks up the boy, but accidentally drops him off the cliff, too (serves him right for throwing a rock at the Monster!). 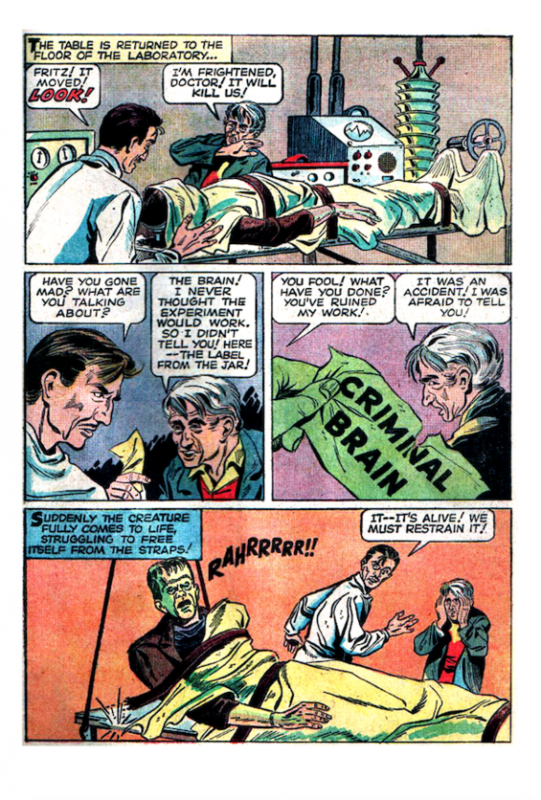 Dr. Frankenstein and Fritz track the Monster down, drug him, and take him home. The local constabulary and the burgermeister figure this must be the work of Dr. Frankenstein, and head for his castle with torches. The three of them escape via a secret tunnel, where the doctor reads in a newspaper that America is hosting a meeting of the world’s leading scientists! They hypnotize the Monster, put him in a coffin and board a steamer bound for the States. After cryptically hinting to the ship’s captain as to what’s in the coffin, the captain unexpectedly drops by their cabin, and sees the undead creature. The Monster, still hypnotized by the doctor, is ordered to strangle the captain, which he does. The three of them arrive on shore, meeting up with Hobbs, a farmer that Frankenstein made arrangements with earlier. Hobbs comments “You know, this is pretty risky business, helping people get into the country illegally.” Dr. Frankenstein’s response? “You’ve been paid well enough for your trouble.” So shut your yap, Farmer Brown! While in the barn, Fritz proves to be way more trouble than he’s worth, provoking the giant, murdering monster for no good reason. Unfortunately, Fritz can’t remember what the code word for “stop” is, and the Monster is now again on the loose! He smashes his way out of the hotel, knocking the good doctor over. He seeks refuge on an ocean liner, marked with “Danger–High Explosives On Board” signs, where some welders, scared by the Monster’s sudden appearance, drop their tools, setting the ship on fire. To make matters worse, they tell the cops the Monster started the fire! The police and fire department don’t want to risk an explosion so close to the city, so they tug the ship farther out to sea. 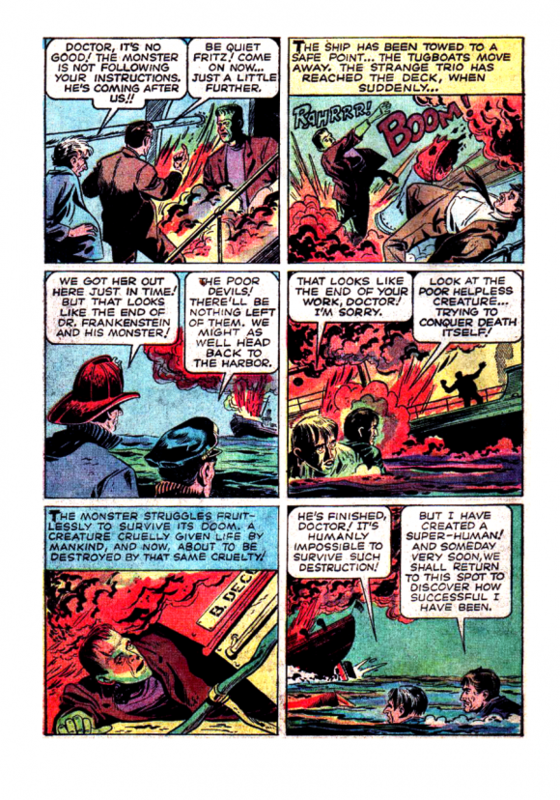 An explosion knocks the doctor and Fritz into the water, but traps the poor Monster. The last we see of him, he is pinned under some debris as the fire engulfs him. As you can see, the doctor is just so torn up over the living hell he’s put his creation through. It’s unfathomable what Dell was thinking with this. Selling the book as a movie adaptation is a cheat beyond belief and, in their own way, Dell came up with an even grimmer story than the one they were diverging from! 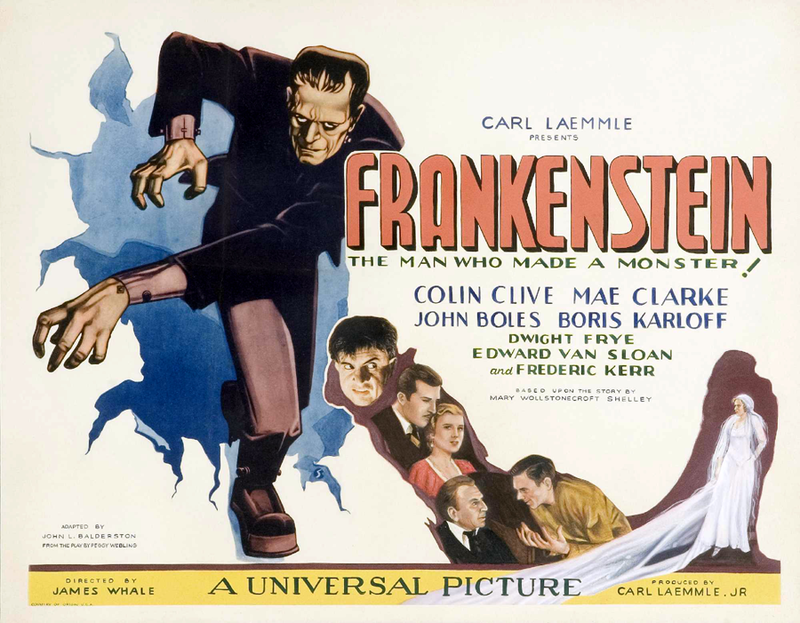 Sure, the original Frankenstein movie is a tragic one, but the poor creature in this version is repeatedly subjected to torment and forced to murder people in cold blood, mostly so Dr. Frankenstein doesn’t have to get his hands dirty. To make matters worse, all this murder and mayhem is presented via Bob Jenney’s serviceable, if not downright boring, art. Combine that with the Day-Glo colors, and you end up with a very curious combination, where the look of the book is totally at odds with its story. I’m trying to imagine what kids must have thought about this comic after plunking down their 12 cents, lured in by artist Vic Prezio’s dynamic painted cover, and getting a story that bears zero relation to the movie it was ostensibly adapting. 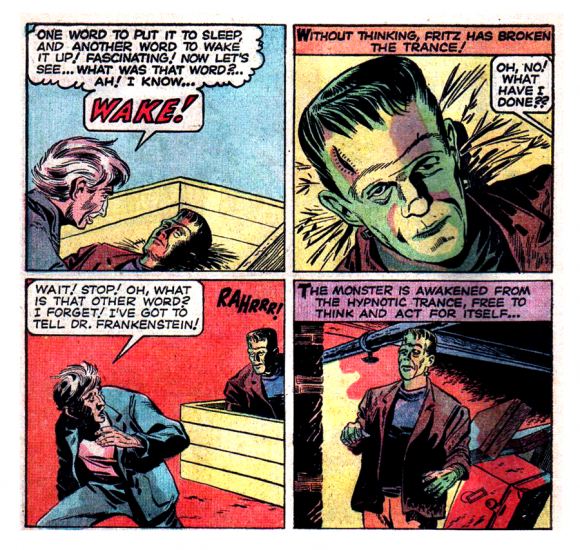 Of course, pop culture would change dramatically in just a few years, and comic readers would have access to much more moody and graphic adaptations of the Frankenstein story, thanks to some wonderful comics from Marvel’s House of Ideas in the 1970s. But in 1963, this had to do. Rob Kelly is a writer/artist/comics and film historian. He is the co-host of The Fire and Water Podcast (and the host of its sister show, The Film and Water Podcast), the co-creator and writer of the award-winning webcomic Ace Kilroy, and the creator of the book Hey Kids, Comics! : True-Life Tales From the Spinner Rack. Fire bad, Prezio good. Thanks for this review, Rob! I’ve always been curious about this comic, but was never able to track down a copy at a price I wanted to pay. Of course, my curiosity stemmed from the beautiful cover, but I had a feeling the comic inside would not live up to the cover. Although Dell had some fine artists working for them over the years, much of their output was rather dull and workmanlike. Also, they always used a fairly generic color palette so even a grim story looked like Walt Disney on acid. I’m glad you confirmed my suspicions and look forward to your reviews of the other Dell adaptations.